Phyto-oestrogens are plant molecules that are molecularly similar to the oestrogens produced in our body. They can therefore stimulate some of the oestrogen receptors giving a similar instruction to the receiving organ in the body. They are generally much weaker than our own oestrogen so they can have a modifying influence in the body. Oestrogen is a growth hormone and is responsible in the body for building breast tissue and the endometrial lining of the womb. It also has a regulating effect on the cells that breakdown bone as well as having a positive influence on our feel good brain messenger called Serotonin. If oestrogen levels are too high phyto-oestrogens may reduce their effect by blocking the receptor with a weaker message or if oestrogen is low they can support the body by providing slightly higher or increased oestrogen level. - wheat, wheatgerm, barley, hops, rye, brown rice and oats. - flax seeds, sunflower seeds, pumpkin seeds. - apples, cherries, pears, cranberry, dates, pomegranate, plums. - soybeans, lentils, haricot beans, broad beans, kidney beans, lima beans mung beans, black eye beans, chick peas, bean sprouts, peanuts. - sage, wild yam, borage, astragulus, liquorice, ginseng. One of the richest sources of phyto-oestrogen comes in the form of isoflavones found in Soya. 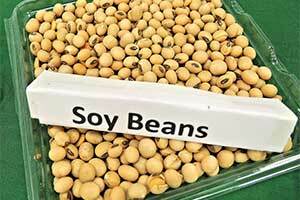 Many people are confused when it comes to Soya products due to confused messages in the press. Soya Bean as a food is high in protein, high in phytates and rich in these phyto-oestrogens called isoflavones. If the food you are eating says it has Soya Protein Isolates it means that the food is high in protein and phytate but may not be high in isoflavones. This is because the extraction process they use to obtain the protein destroys some of the isoflavone content. The phytate content can also prohibit the absorption of important minerals such as calcium and zinc which might be needed for bone health. In some cases therefore Soy should be eaten in moderation. For the isoflavones to have an active oestrogenic effect in the body they need to go through a process of fermentation, this can be done by food processing or by our own natural bacteria found in our digestive tract. Foods such as soy flour, Tofu and Soya Milk products do contain isoflavones but the foods have not gone through a process of fermentation so activation will depend on how healthy your digestive tract is. Also soy is often over processed and usually GMO (genetically modified organism), which means the genetic material has been altered using genetic engineering techniques, so no longer contains anything beneficial. Traditional soy foods from Japan have gone through a fermentation process and therefore are rich in active isoflavones. These foods include Soy source, Tamari, Miso and Tempeh. Phyto-oestrogens of this kind have strong oestrogenic effect on the body, which is why they are so good for women through the menopause or for people with deteriorating bone quality.